Geomagic is ready to go at Fab Lab! The Fab Lab at American Tobacco Campus got underway today. We got a sneak peak yesterday while setting up, and it looks great. Shopbot is on hand to help you with fabrication, and the trailer is ready for you to visit as well. A special thanks to the American Tobacco Campus for all that they've done to help get everything setup and ready to go. We'll be on hand tomorrow, March 17th, as well as Tuesday, March 22nd and Thursday, March 24th. After a lot of testing and calibrating yesterday, we're ready to go with our Creaform Handy Scan, and our 3D Systems VFlash 3D Printer. Stop by for a demonstration on how this works, and get a hands on demonstration with one of our engineers on how to make all of this technology work. 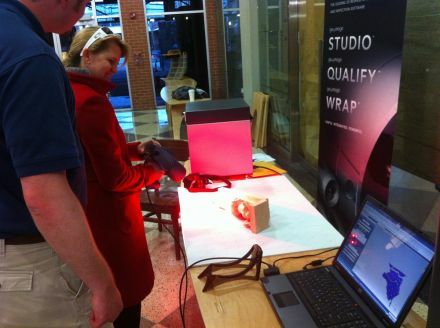 Feel free to bring objects down to get scanned, and we'll show you how the process works from start to finish. Look forward to seeing everyone over the next week at Fab Lab!